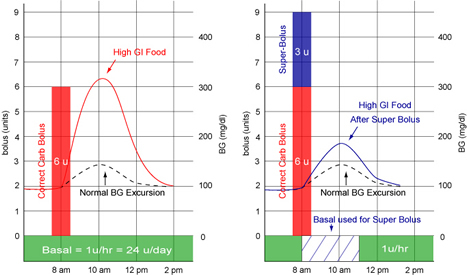 Current basal-bolus thinking says that 50% of the total daily dose of insulin works best as basal, and that a change in basal insulin delivery should occur several hours before a rise or fall in the blood sugar is desired. These ideas need to be rethought as newer, intelligent pumps begin to appear. It is time for Super Bolus. A Super Bolus is created when some of the basal insulin delivery is stopped or partially reduced, and delivered instead as additional bolus insulin on top of a normal carb or correction bolus. This shift of basal to bolus insulin creates a larger bolus that can have more impact in situations where more insulin is needed quickly. These situations may include but are not limited to covering high glycemic index foods, larger intakes of carbohydrate, and speeding the return of an elevated blood sugar to normal. Exchanging basal and bolus insulin is not a totally new concept. Some pumpers currently use a temporary basal reduction to reduce their basal rate at bedtime when they have excess insulin on board (IOB) or active insulin in the body. For example, if someone has a blood sugar of 150 mg/dl at bedtime, as shown in Graphic 1, and their blood sugar falls 50 mg/dl for each unit of insulin (correction factor), but they have 3 units of IOB, they might choose to offset this excess of bolus insulin with a reduction in their basal insulin delivery by 2 units. This allows them to skip a snack to bedtime to prevent the pending low. There is also a less obvious form of bolus shifting that can be extremely helpful to blood sugar control. Let’s say a person is hurried and wants to eat 72 grams of a high glycemic index cereal right away. They know from experience that a 6-unit bolus will cover the cereal eventually, but their blood sugar will spike to about 300 mg/dl in two hours before it returns to normal 4 to 5 hours later. One option to avoid this spike is to take some insulin from the slower basal delivery and give it all at once as a larger Super Bolus. The increased bolus delivery prevents the postmeal spike as shown in the graphic to the right, while hypoglycemia is avoided by the rapid reduction in basal delivery equal to the amount of insulin which is added to the usual premeal bolus. 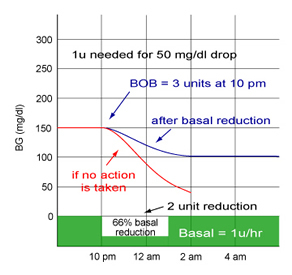 In Graphic 2, the basal rate of one unit an hour is reduced to zero for three hours. These 3 units are added to the normal 6 unit breakfast bolus. The 9-unit Super Bolus prevents the blood sugar from spiking after the cereal is eaten, while the rapid basal reduction prevents the blood sugar from going low later. This maneuver greatly reduces exposure to hyperglycemia after meals, especially those with a high glycemic index and those containing a lot of carbohydrate. Postprandial hyperglycemia is a major cause for high A1c levels. A simple case like this can be done with older pumps (511, 50x, xTRON, 1000) if the user keeps track of IOB. Today’s smart pumps enable the user to see how much residual bolus insulin is still active so this can be more easily accounted for. Graphic 3 shows another situation. Here, the carb content of a meal is underestimated and the blood sugar spikes two hours later. Rather than waiting for a small correction bolus to bring down the high reading, a Super Bolus is given to bring the reading down more rapidly and reduce the exposure to hyperglycemia. Tomorrow’s intelligent pumps will be able to easily shift basal to bolus and keep track of the IOB and exact strength of IOB versus how rapidly the basal insulin will fall. This will allow a true physiologic balancing of the insulin level. In the future, the Super Bolus can be programmed so it is offered as an option when the number of carbs to be eaten is larger than say 30 or 40 grams (a user selected quantity). A carb intake smaller than this would be unlikely to cause postmeal spiking. Offered as an option when larger amounts of carbohydrate are eaten, the user can select to use a Super Bolus for foods they know raise their postmeal reading. One problem with using the Super Bolus is that another concept will need to replace IOB, which is based on separate basal and bolus delivery. Following a Super Bolus, the IOB will no longer carry the same meaning. Eventually, as carb databases are built into intelligent pumps, PDAs, and smart phones, the databases could also contain the glycemic indices for these foods. A Super Bolus could become automatic for more than a certain amount of that particular food. When foods with higher and lower glycemic indexes are combined, a super Bolus could be appropriately modified to match the combination. As pre and postmeal blood sugars are associated with food choices and carb quantities over time for an individual, an individualized Super Bolus, now called a Smart Bolus, could be created so that any food which affects their readings would be dealt with by specific basal and bolus insulin responses. Data collection allows the intelligent device to adapt the balance between basal and bolus insulin delivery appropriately. The Super Bolus is discussed in the 4th ed of Pumping Insulin, 2006, on page 56. It was also evaluated in a paper by J. Bondia, E. Dassau, H. Zisser, R. Calm. J. Vehí, L. Jovanovic, F.J. Doyle III, Coordinated basal-bolus for tighter postprandial glucose control in insulin pump therapy, Journal of Diabetes Science and Technology, 3(1), 89-97, 2008 This mathematical modeling study found that 3 hours of basal could be shifted into a bolus and lead to a significant lowering of PP glucose levels. It is also supposed to be mentioned in this upcoming book Balancing Pregnancy with Pre-Existing Diabetes.